Mamec Side entry Mixers are a result of years of development work. In the side mixer’s structure the special requirements for the use has been taken into account together with serviceability and compatibility with the factory standards. 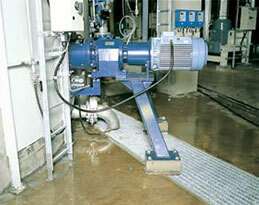 Mixers represent the newest thinking in the industry and are really reliable and long lasting in use. The structure of Mamec side entry mixer offers a number of benefits compared to to conventional solutions. It consists of concentric parts and every components are by bolt and screw joints. Thus mixer’s economic activity and exceptionally good operational reliability will be achieved. Every part of the Mamec side entry mixer is thoroughly thought and their activities have been tested in practice. Using them guarantees a safe operation – efficiently and saving energy at the same time. 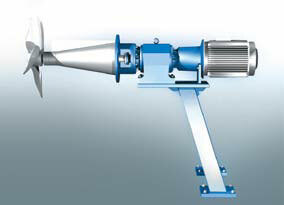 The structure of side entry mixer allows a large distance between the propeller and the tank wall. Mixing is done with the best efficiency. Thanks to the spiral propeller and frame controller, the mixer is very energy efficient. The efficiency of the Mamec side entry mixer has been of great importance when designing. Therefore, it is usually possible to select an drive unit with one of the lower connection power than to the corresponding competing mixer models. superior features compared to conventional solutions. The effect of the distance between the propeller and the tank wall on the mixing result has been researched. The structure of the Mamec mixer allows the great distance required by the survey results. The structure of the mixer body is conical and therefore very strong. The structure is such that it reduces the turbulence phenomenon. The mixing is carried out with the best possible efficiency. Propeller blades are in the form of spirals. With spiral propellers it is possible to achieve efficient energy use. The flow controller on the mixer body is energy saving. The design of the driver ensures that the mixing substance’s spiral like rotation is minimized. The mixer propeller has a large diameter. It ensures a good mixing result in relation to the power used. The electric motors are delivered either integrated with gear or IEC connection. As an option condition monitoring. The gear unit or integrated geared motor is selectable by the operator’s factory standards. Energy-saving flow controller that reduces the Vortex phenomenon. Spiral propeller ensures high efficiency. A coupling that allows dismounting of the gear without emptying the tank. A very strong conical frame structure. It allows a large distance between the tank wall and the propeller and minimizes the turbulence phenomenon.